Home » Dips/Sauces » Carmella’s Easy Red Clam Sauce – simple means tasty, you can put this together quickly and easily. Carmella’s Easy Red Clam Sauce – simple means tasty, you can put this together quickly and easily. You can put this meal together in less than 30 minutes. Start your pasta, and gather up your ingredients and by the time the sauce is done, your pasta will be done as well. Thanks to cdalberto for this recipe. Make this easy red clam sauce, you can put dinner together in no time at all. 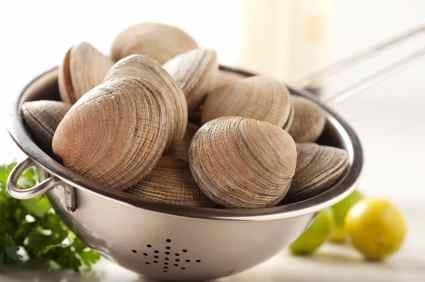 Drain cans of clams or clean the fresh clams.Heat olive oil in heavy bottom pot and add garlic throw in clams if using fresh lower hear and add lid and wait until all clams are open. Discard unopened clams. Dump in sauce and simmer 10 minutes. Add salt and pepper or any other seasoning you like. Serve over pasta with your favorite bread. This was a great clam sauce.